I hope you all had a great weekend. I'm loving the classic look of black and white outfits at the moment, but I always have to add a little pop of color - and you can never go wrong with hot pink. Not to mention, I always add as much gold as possible and this necklace from I Crave Jewels has quickly become one of my favorites. 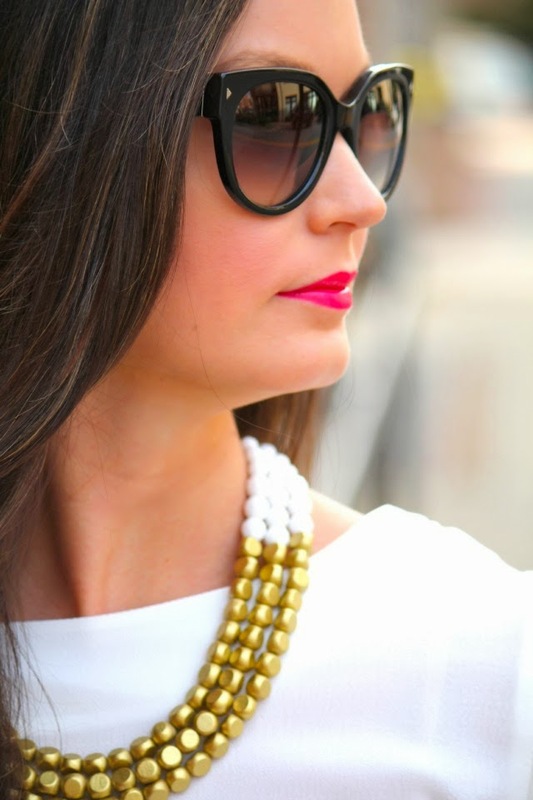 The white + gold is absolutely perfect for layering on top of any color and I love the wooden look of the beads. Leave a comment below letting me know that you've entered and the winner will be announced on Friday! Thanks so much for stopping by and have a lovely day! xo. I followed all the requirements to enter! I did all of the requirements :) ellenr886@gmail.com yay! I liked everything, thanks for the opportunity to win such a stunning neckalce! I followed all those :) I already bought an icrave necklace before obsessed! Liked and followed as instructed. :) I love Crave Jewels necklaces! This one is a beauty. Thanks for the opportunity! Followed, Liked etc.... :) Love this necklace! Crave Jewels necklaces are gorgeous! Thanks for the opportunity! Obsessed with that outfit! your hair looks super cute, what hair products do you? Also, how often do you get a trim/hair cut? I liked/followed what you requested to be entered to win that beautiful necklace! Fingers crossed for me & thanks for the opportunity! Fun! I already like you and Crave Jewels on both IG and facebook! Thanks so much for the giveaway! Liked and followed as instructed! Entered! Love the Crave Jewels earrings and those pants you're in are to die for! Liked and followed all 4 steps - thanks for the giveaway! So pretty!! I really love this look.. I really like this look - especially the clutch! I love this look. The pop of pink is precious! I also filled out all the entries! I entered and followed :)! I love your blog and am excited to check out more of Crave Jewels's work....love supporting independent designers! Love this! I really want a pair of print pants!! I have entered to win! Thanks! I completed the 4 requirements! Completed all four! Thanks for the giveaway! Completed all four! Thanks so much for the giveaway! I completed all steps on instagram as @rayraycartucci and on fb as rayray cartucci rachelcartucci@gmail.com thanks so much!!!! LOVE it!!!! Love the outfit, classic black and white are my go to! Thank you to you and Erin from Crave Jewels for the great giveaway, that's a gorgeous necklace and I entered all 4 ways!! Those pants are to die for! You look gorgeous. I followed and friended! Thanks for the giveaway! I did all the steps :) Awesome necklace!! Entered! I'm 'craving' a little gold in my life! I entered! I love the whole look. I entered. Love the whole look! I'm following via the social media indicated. They have some really pretty jewelry. Thanks for the giveaway opportunity. I entered and followed all requirements! Done! I'd love to win that gorgeous necklace! Entered! Such a lovely giveaway. ps. This outfit is ADORABLE! I've entered - all the way from Australia! I follow @meganrunionmcr and @icravejewelson instagram, username @PjoyC. I 'Like' For All Things Lovely and Crave Jewels on facebook. I entered following all requirements. I did all of the requirements!